Paintings of Wounded Men, Placard Signs at Grotte de Cougnac. Red ochre painting of an ibex. his back and upper thigh. The prehistoric art in Cougnac Cave (Grotte de Cougnac) is stylistically linked to the imagery found elsewhere in the Lot region, such as the Pech Merle Cave paintings (25,000 BCE), the Cussac Cave Engravings (25,000 BCE) and the Roucadour Cave Art (24,000 BCE). Cougnac is noted for its cave painting featuring wounded human figures, and for its strange abstract symbols - notably its aviform or "Placard-type" signs, named after Le Placard Cave, also in the Lot region. In addition, the cave contains paintings of animals (ibex, megaloceros, mammoth), as well as a fingermarks in red and black pigment. 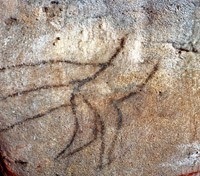 The earliest art at Cougnac dates from the Gravettian era, and was in fact the first example of Ice Age rock art in France to be directly dated. 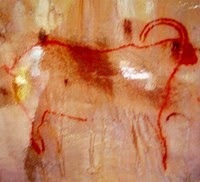 For details on the chronology of cave painting, see: Prehistoric Art Timeline (from 2.5 million BCE). The Cougnac Cave - actually there are two caves (about 200 metres apart), one noted for its Paleolithic art, the other noted for its mass of stalagmites and stalactites, known as soda straws - is situated in the commune of Payrignac, near Gourdon in the Lot region of southwest France. The Paleolithic cave was discovered in November 1952 by Lucien Gouloumes, Rene Borne, Jean Mazet, and Roger and Maurice Alphonse Sauvant, with the assistance of a water dowser. The following year an examination of the cave's parietal art was conducted by Meroc and Mazet. Later excavations were performed by the archeologists Michel Lorblanchet and Mrs Helene Valladas, who conducted numerous tests, including radiocarbon dating and pigment analysis. Cougnac was the first prehistoric site of Franco-Cantabrian cave art where a direct radiocarbon date was obtained for its Stone Age art. To begin with, in the late 1980s, Lorblanchet obtained a date of 12,000 BCE from a black charcoal dot found on the end of the "Mammoth Frieze". Later, samples of red ochre paint pigment from a megaloceros produced dates of 21,000 BCE and 20,750 BCE. Finally, analysis from a second megaloceros yielded a date of 23,000 BCE. In other words, the oldest Stone Age art in the cave was produced around 25,000 BCE; this was followed by a second phase of painting which occurred a few millennia later. Art then stopped for about ten thousand years until the final period of Magdalenian art (c.12,000 BCE), when a new set of humans left finger markings on many of the walls. Note: For more details of the colour pigments used by Stone Age artists, see: Prehistoric Colour Palette. Cougnac Cave has three galleries. The largest and most important one is about 100 metres (330 feet) in length, about 8 metres (27 feet) in width, and 3-6 metres (10-20 feet) in height. At the end it leads into the main chamber, which contains most of the decorations. Halfway along the gallery a side passage contains an important set of six complex bird-like (aviform) signs, which are identical to abstract signs found at the neighbouring cave of Pech Merle - and among the more distant Cosquer Cave paintings near Marseilles - and seven rock engravings found at Le Placard Cave near Rochebertier in the Charente. Because the latter could be securely dated, these signs were christened "Placard-type" signs. Lastly, the pairs of red and black lines at Cougnac are similar to markings at La Pileta Cave (c.18,000 BCE) near Benaojan in Malaga Province, southern Spain. The main chamber, at the end of the gallery, contains a frieze of red ochre figures along its left-hand wall. This features ibexes, mammoths, and three extinct giant deer or megaloceros. In addition two wounded men are shown - one appears to have three spears sticking in him, the other has seven. A number of stalagmites were broken to ensure a clear view of the frieze from the other side of the room. In addition, two large stalagmites in front of the ibex figure in the centre of the frieze were coated with red ochre, thus forming a frame through which to view the animal. The ibex has been carefully positioned so that the flowstone on the wall looks exactly like long hair hanging from the belly of the animal. In total, Cougnac's cave art consists of 60 painted images of animals and 50 hand stencils, as well as numerous pictographs including a quantity of punctuation marks (lines and dots) and pairs of black bars and curves. In addition, there are pairs of fingerprints in black and red throughout the cave. The oldest Stone Age petroglyphs in France. The most sophisticated parietal art of the Aurignacian. Best known for its spooky hand stencils and handprints. Noted for its bas-relief culpture of a salmon. Major site of Magdalenian art, second only to Lascaux. Over 250 pictures, including tectiforms and serpentiforms. Famous for its prehistoric 'footprints' and a unique drawing of a weasel. Has 600800 engraved drawings of animals plus 50 anthropomorphic figures.  For more about prehistoric Placard-type geometric symbols, see: Homepage.